Choosing a Good Portable Basketball Hoop online may be a little bit difficult job because the landing page of every product describes its quality and features but no one mentions their deficiencies. 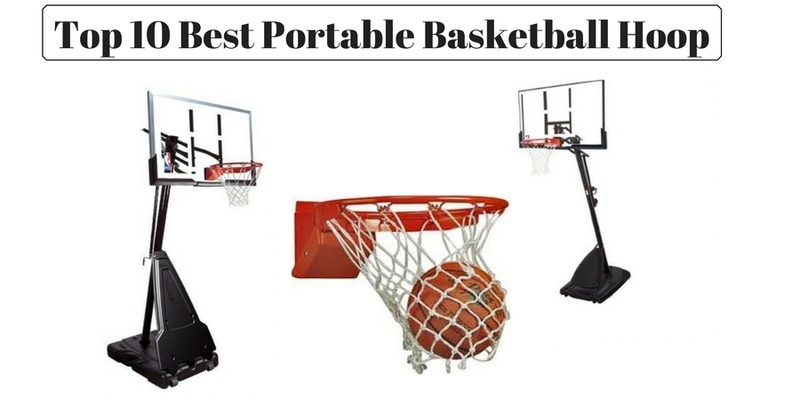 So, in this post, we are going to give you a detailed review of Best Portable Basketball Hoops with a detail table of comparison and their pros and cons. These are main ingredients of any portable basketball hoop. The thing which differentiates different basketball hoop from each other is the Quality of these 4 elements. So, to select a portable basketball hoop for your self you will have to compare these 4 factors with the below-mentioned data. The backboard is most important and most expensive part of a basketball hoop. It makes almost 40% of the total basketball hoop by area. The main and only function of the backboard is to resist the basketball and bounce it back either to the goal or to the court. In current basketball hoops, almost all backboards are of same size and include same physical features like same graphics but the material of which they are made of may be different. Polycarbonate Backboard: This one the most common and the cheapest backboard made of a rigid plastic. Polycarbonate is not much rigid but if you are buying a basketball hoop just for a weekend fun game, then polycarbonate type can be the best choice for you. One of the disadvantage of this backboard is that it does not give an effective bounce back to the basketball. Acrylic: The second type of hoop backboards are Acrylic backboards. These ones are made of thermoplastic acrylic which are much more tougher and resistive than Polycarbonate. Majority of Basketball hoops used in schools, colleges or for local events are Acrylic type of basketball hoop. This one is expensive than polycarbonate although both are made of plastic still quality and rigidity of this backboard is more than the polycarbonate. Tempered Glass: This one the most expensive type of hoop backboard. Made of special rigid Gorilla Glass, it is the toughest Basketball hoop backboard with amazing bounce back quality. In All the professional games and leagues, basketball hoop with tempered glass backboard are used. Basketball hoops of this backboard are way much expensive than the other two. The breakaway rate of this backboard is also much less than the other two. Hoop Rim is the second most expensive and important part of a basketball hoop. Just like backboard rim also comes in 3 different types. The material may be same in all or may vary but here the division is because of its bouncy spring option. Some rims include external spring, others have double internal bouncy spring while the third category don’t even include it. Simple Rim (Without Spring): Simple or without spring rims are the most basic or ancient type of hoop rims which are not that much expensive and are mostly used in low-cost basketball hoop. They may be made up of different material depending upon the manufacturing company of the hoop, however, most of them are easily bent and breakaway because they do not include any spring system. A small pressure of the rim can bend it from its normal shape. External Spring Breakaway Rim: These spring do include a breakaway spring which can help the rim to resist bending and breaking. It may include single or double Spring System. One of the disadvantages of this type of rim is that there a good chance for the spring to get rust easily because it is exposed to the environment. Enclosed Spring Breakaway Rim: These are best types of hoop rim which not only protect the rim from bending and breaking but also give it a bouncy action. Enclosed Spring Rims are also safe from rust because they are covered with the plastic material of the rim. 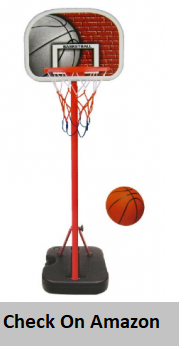 Portable Basketball Hoops and even in ground basketball hoops come with a three pieces pole which can be adjusted and fixed into one another and with the backboard and base of both ends. Pole provides support to the backboard and gives a firm supportive design. There is not much difference between the pole of different basketball hoops. They are usually quite similar. Fix Poles: This type of pole are not usually used nowadays. You would rarely found a fixed pole in any basketball hoop nowadays. They are no more in use because they are only one piece and do not include any height adjustment feature. Height Adjustable Pole: These are most commonly and latest form of poles. They are composed of three pieces which can be fit into one another and include height adjustment feature in different ranges. Base is the only part of a basketball hoop system which differentiates a portable hoop from the inground one. It gives portability to hoop system. A base can be filled up with water or sand which makes the hoop erect and strong. Most of the bases have a capacity of 25-27 gallons of water or sand. Most of the new hoop bases include two wheels which make it easy to carry the hoop from one place to other, however, some of them may come with a flat base which needs to be lifted to shift from one place to other. Lifetime is definitely a very well-reputed and renowned brand when it comes to designing sports goodies and merchandise for potential players. The Lifetime 90040 is definitely a crowd pleaser product as well with promising built and multipurpose use. 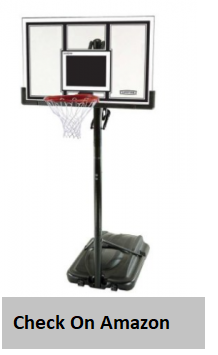 This portable basketball hoop comes with a backdrop board of around 44 inches in its measurements. The hope is designed to set up best at a height of 7 to 10 feet (the height is adjustable manually). The best part about this portable hoop is that it does not require for you to have a wide professional court to get it installed. You can easily set it up at home and enjoy its recreational use with family and close friends. The specialized telescopic mechanism has been used to give this basketball hoop an added oomph factor. It is pre-installed and does not require for any additional tools to set up once it comes out of the box. The backboard is also very well-protected against all dust and heat damage. It is designed with a UV preventive layer that gives it added reliability. This is surely a great value product for your money that promises great entertainment to prospective users. The materials used in the formation of this basketball hoop are high quality and used in rightful proportions. The backboard comes with a 44 inches wide support in its horizontal measurements. The telescopic phenomenon is used to make this portable hoop easy to adjust manually. The height can be adjusted from 7 to 10 feet. All materials are dual coated on the exterior for longer durability. It comes with a 5-year product user’s warranty. 27-gallon base fills with water or sand and rolls to your desired location. The first highlight benefit is its affordable price range. It is a great budget product. The product warranty lasts for up to 5 years that promises security of the financial investment you make in this hoop. The height is adjustable from 7 to 10 feet. It gives users the chance to set it up in accordance with personal preference. The backboard comes with UV protective film that makes it more durable for long-term use. There are no reported cons for this product. Lifetime is surely offering a great product investment with this high-end and portable basketball hoop. It is designed to tick off all the essential boxes on the checklist; quality, durability and price get a thumb up. With a 5 year warranty, this product is all that you want a great portable basketball hoop to be. It is sturdy and solid in built and structure. This Pool Basketball Hoop is made of combination top quality materials that make it increasingly durable and great for long-term usage.The height of this basketball hoop is static and not adjustable. However, in addition to a wide angle backdrop support, it also comes with a sturdy base support. This makes the basketball setup an ideal choice for poolside use where it will be very stable against all the dampness. 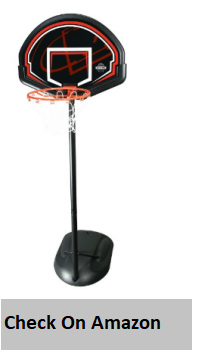 The 1301 portable basketball hoop is affordable in price. The backboard support of this Portable Pool basketball hoop is around 44 inches which provides ample stability to the users. The high-quality combination nylon, stainless steel, and polyethylene makes this basketball hoop very durable. It is externally dual coated for added protection from the surroundings. The basketball hoop comes with a base support for sturdy stand against the poolside. It is supremely easy to assemble and disassemble. For added convenience of the customers this basketball system comes with a detailed user’s manual guide. It is dual coated on the exterior for protection against rust, rot and weather extremities damage. It comes with a wide width 44 inches backdrop support which gives it stronger stability. This is a value product and is very moderately priced. It is reported to be lightweight but users complain it to be heavier than what a portable hoop should be like. The height of the hoop is not adjustable and this restricts usability for the users. Portable, lightweight and easy to assemble/disassemble; this basketball hoop is meant to make your pool day with family and friends multiple times more fun. Lifetime is back with another promising product with this poolside portable basketball setup. Buying portable basketball goals can be a daunting task if you are on it for the first time. However, brands like Lifetime are surely making this much difficult task pretty simple and sorted. The latest product by Lifetime is the youth portable basketball hoop and it is surely a wonderful addition to the wide family of basketball setups by Lifetime that is available in the markets already. 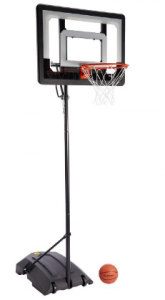 This basketball setup is truly portable and petite with only a thirty-two inches backboard support. Don’t judge by the number for this support to be not good enough because according to the size and structure of this goal – this is the best support it could get. The height of the goal is also easily adjustable manually and can be adjusted between five point five to seven point five feet in height. It is the best delight for an enthusiastic sports lover with a product warranty that lasts up to 5 years on a stretch. The height of the goal is also easily adjustable manually and can be adjusted between five point five to seven point five feet in height. It is the best delight for an enthusiastic sports lover with a product warranty that lasts up to 5 years on a stretch. The backboard support comes with a 15 inches sturdy and solid support. It is made of high quality combination materials of nylon, PVC plastic and stainless steel. The height of this basketball hoop is easy to adjust manually. It comes with up to 5 years of efficient usage warranty. 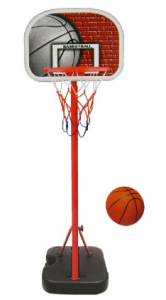 The price of this basketball hoop is very affordable which makes it easily accessible for a wider consumer audience. The backboard support of this basketball hoop measures up to be 32 inches which is not wide but good enough to make it reliable and strong. You get a long-term product warranty for stress-free usage of this hoop. It is dual coated on the exterior to be weather resistance and heat/rust resistant. High-quality material formation makes it durable for long-term use. This product lacks proper instructions to set it up so the assembly can be a tedious and time-consuming task. It is not suitable for children. It works well for only teens above the age of 14 and adults. Who doesn’t love basketball? Well, if you are a fan of the game as much as the rest of us – Spalding is the choice for you to make. It is the perfect portable basketball hoop addition that you can make inside your home. The 66291 Spalding portable basketball net is your best partner to carry along on road trips too; owing to its unbelievable lightweight built. The height of this goal is also manually adjustable and can be adjusted anywhere between 7 to 11 feet. However, there is one thing about this net that is undeniably the best part about it – the price! It costs amazingly low and this is a buyer’s delight because they get the most amazing hoop at the best price deal ever! Spalding is surely the way to go. It is very modest in its dimensions and measures to be 55 inches by 32 inches in width and height respectively. The formation of the hoop stand and back support is made of 100% authentic acrylic and stainless steel combination material. It is very light in weight and can easily be moved around. For added user ease; the pole comes with a detachable wheel stand in order to move the pole easily around from one place to another. The quality of this product is simply amazing; unbeatable in its quality and built. This portable basketball hope is super easy to assemble once it gets out of the box. It is very lightweight which makes it even possible for small children to move it around places. 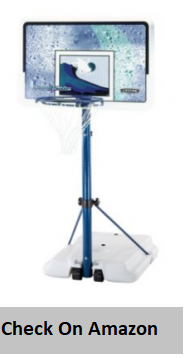 The price is surprisingly low, considering the perfect product this basketball setup is. The basketball goal height is manually adjustable. The structure of this basketball hoop could be more sturdy and stable. It often loses its balance and stability. The quality is great but starts to decline with everyday use which surely does not make this basketball hoop ideal for long-term use. Spalding surely offers a well-built and top quality basketball portable hoop with this goal. It comes with solid support and performs well too. The low price also makes it a winner in our books. Lifetime brand is back with yet another worthy and wonderful addition to its family of sports goodies. This basketball hoop is designed to serve well with a wide size fifty-two inches backboard preset on the back. This is one of the largest in width backboard that comes with a portable basketball hoop for support. This means you will get a lot of solid support and sturdiness with this amazing portable hoop pole. Interestingly, the backboard looks much different than any average looking backboard as well and comes with a suitable break-resistant covering over the board. Interestingly, the backboard looks much different than any average looking backboard as well and comes with a suitable break-resistant covering over the board. Moreover, it is also made of only the finest quality of stainless steel. The adjustments of the height of the pole are also possible manually and can be adjusted anywhere between 7 to 11 feet of height. This is one of the best and most stable in position portable and foldable basketball hoop that you can get your hands on from the lifetime family. It is also very easy to store and says well-hidden because of its petite closure. This is one of the best and most stable in position portable and foldable basketball hoop that you can get your hands on from the lifetime family. It is also very easy to store and says well-hidden because of its petite closure. The backboard measures up to be 52 inches in width which is the widest size you can get. The backboard comes with a break-proof coating to prevent it from breaking by repeatedly being hit by the ball. The exterior of the pole comes with a dust coating for added protection against all types of weather adversities. The product comes with a long-term 5-year warranty. The basketball hoop looks very attractive and different; all thanks to the stainless steel and waterproof frame. The exterior surface of the stand comes with a portable coating against weather abnormalities and extremities. The stainless steel backboard adds a lot of solid support to the basketball hoop. It is boosted with shatter-resistant technique. The height of the pole is adjustable manually between 7 to 10 feet. The exterior pole is dusted with matte powder to protect the color of the pole and base. The product warranty for this basketball stand is up to 5 years which is long enough but it works only for minor repairs. The basketball hoop setup come incomplete and important pieces of the system are missing from the box. There is no product warranty that you can claim for any replacements or substitutes of the product which is a shame. Assembly is surely not easy and takes up too much time as you have to figure out how to get the setup together without essential pieces in the box. Lifetime is back again with this high-quality product that comes with superior design and strong built. It is strong, powerful and offers a lot of support to the users to set it up whenever and wherever! Lifetime is a brand that you can trust. This portable basketball system offers great support and comes in majestic dimensions. The backboard support is made of authentic stainless steel material and is modest 50 inches in dimensions. This is one of the best sizes that you can get your hands on. The height of the pole is adjustable between 8 to 11 feet. The adjustments of the pole need to be manual. 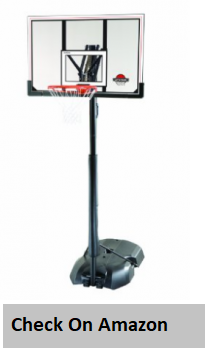 This heavy-duty portable basketball pole hoop comes with a long-term trust warranty. The backboard of the 50 inches board is made of stainless steel and gives a reliable built and strong support to the users. The heavy duty built of this basketball hoop gives it added stability and sturdiness. The exterior of the basketball hoop is dusted with porcelain powder to make this basketball protected against rust, rot and color fade. The product comes with a long-term 5-year product warranty. 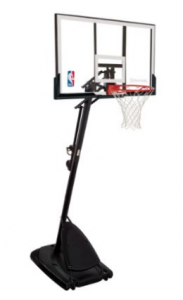 The portable base frame of the basketball hoop comes with a detachable wheel frame stand. This is surely a very well-constructed and well-built product. 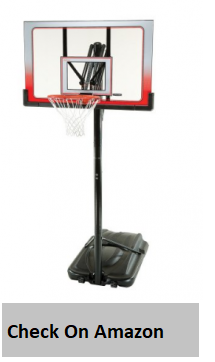 The solid built gives this portable basketball hoop a lot of stability, support and sturdiness. The height of this is adjustable and can be manually adjusted as per your please. The exterior of the basketball pole comes with a great coating that protects the pole from rust and rot on the outside. There is a 50 inches wide backboard support that promises added support to the pole. This is definitely one of the best sizes you get. There is the basic deprivation of a good and detailed customer guidebook to assemble the product. This makes it such a difficult task for the users to figure out how to put the thing together. Assembly of the product is a super slow and tedious task – as already mentioned above. The basic product comes with the main pole and some parts of the setup. The rest of the tools of the system are noticeably missing from the box and need to be purchased separately. This is an added expense to an otherwise affordable product. Lifetime is definitely a name that you can trust when it comes to basketball hoops that are portable and other sports goodies. This portable hoop for balls is the best of its kind and definitely promises supreme functionality with amazing usability. With good price value and long-term product warranty; this product is definitely a worthy choice to make. How would you feel if you got the chance to carry your basketball around anywhere you wanted to? Amazing right? Well, this is all that this portable basketball hoop is about. 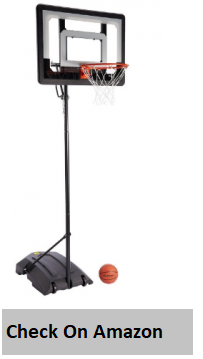 Lifetime brand offers its best deal yet with the high-end and portable heavy duty 71524 basketball system. This portable stand is perfect and ideal to be set up anywhere and everywhere as you please. You can put it up indoors or simply attach to a wall somewhere outside of the home. This is your perfect on-the-go entertainment that you can have. It gives you the best chance to enjoy the game along with friends and family. 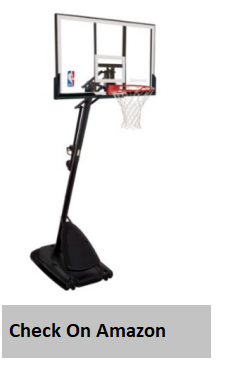 This portable basketball stand comes with modest dimensions of 54 by 34 inches. The backboard of the portable system is made with the ultimate shatter guard technology and makes the system look as amazing as it works to be. The product comes with a 5 year user warranty much similar to all other sports goodies by the Lifetime brand. The heights of this pole are manually adjustable and can be adjusted from 7 to 10.5 feet in height. The exterior of the pole comes with covering that makes it durable and resistant against all odds of the climate and other extremities. The quality of this basketball hoop is as seamless and top notch as one can hope for. The quality of this basketball setup surely does not disappoint. It is suitable for all age groups. There is no age restriction whatsoever associated with this product. It is as seamless and perfect to be used by the adults as it is for the children. This is a great value product on basis of the money. It falls in a very reasonable price range and therefore promises to be accessible for a wide group of consumer audiences. As reported for many other lifetime portable basketball systems; this product also lacks many basic parts within the box. All these parts will be needed to be bought sepeartely if you want the system to be setup perfectly. Assembly and disassembly of this portable system of basketball is almost impossible. There are major parts missing and there is also no instruction leaflet that is included inside the box for guidance. This basketball system is definitely a great value product for all sports lovers. Moderately priced and coming with just as long-term warranty as all other Lifetime merchandise this product promises durability, reliability, and sturdiness. Indoor, outside, court-angle or poolside, convey the ace Mini Hoop machine anyplace. The expert Mini Hoop gadget gives the indistinguishable strength and genius review look as our wonderful advancing ace Mini Hoops alongside the spring activity split away edge. The SKLZ prepared Mini Basketball Hoop device is best for a bit 1-on-1, or to practice your 3-proposals. This contraption will create alongside your competitor as a result of the movable post stature. With a shatterproof and break resistant backboard, and to a great degree strong, eight-circle web, it could manage inordinate pictures from powerful players and the extreme and tumble play of kids. You may ensure that you’re a chuckle will last, with This contraption will create alongside your competitor as a result of the movable post stature. With a shatterproof and break resistant backboard, and to a great degree strong, eight-circle web, it could manage inordinate pictures from powerful players and the extreme and tumble play of kids. You may ensure that you’re a chuckle will last, with tidy and brisk setup. The SKLZ master Mini Basketball Hoop framework comprises of a thirty-three inches by twenty-two inches clean polycarbonate backboard, a movable steel shaft, and a weighted cell base on wheels. It comprises of a seven-point five inches Mini elastic b-ball and a fourteen inches breakaway edge for shutting fun. This loop has the look, usefulness, and solidness of an expert review b-ball framework. It incorporates seven-inch small scale ball, all-climate net, and gathering and alteration guidelines. This is a complete and comprehensive basketball setup that is designed for modern day users. It is built to be professional in its functionality and works to be just as seamless and perfect. The height of the basketball hoops are adjustable manually and can be adjusted as per the user preference. Assembly of this product is very simple and easy and does not take up too much time to get it fixed and stand up. It is well built and the high quality materials that are used in its built give it a sturdy and strong built. This basketball setup is very easy to set up. It does not take up too much time to set it up and get going. So as far as assembly is concerned it is pretty easy. The price of this product is very minimal which makes it affordable for a wider category of audiences. There are no cons reported for this product. This is the perfect little petite and lightweight portable basketball stand that you need to get your hands on. It looks great, is well-built and is very stable as well as sturdy in it design. This is a great value product for your money with modest dimensions that make it a worthy choice for modern day sports players. If your kid loves to play basketball that you should not make him feel deprived of the basic luxuries that he has the right to have in life. This is why the basketball system is designed to be 100% children friendly with very simple built and high-quality materials. This setup is perfectly suitable for all children that are aged 3 years and above. This portable basketball setup is completely lightweight and easy to handle. The modest dimensions of the setup for the basketball game are 14 inches by 10 inches by 5 inches. The height of the frame of the pole is adjustable to be up to 5 and a half feet. The height can be adjusted manually. This is a foldable portable basketball hoop and comes with easy storage options. It is built to be sturdy and solid. This product is 100% children friendly. The materials used in the built of this basketball hoop are high quality and recyclable. The height of the hoop is adjustable to be up to five and a half feet. 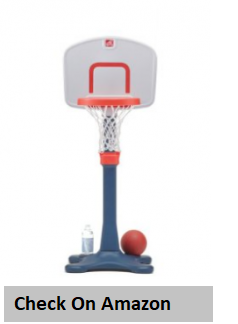 It makes you believe that anyone aged above 3 years can use this portable basketball hoop. This often leads you to believe it is an okay choice for adults as well but unfortunately such is not the case. The quality of this portable basketball children setup can definitely be improved and made better. It is surely a good and reliable product. It is children friendly and hence if you need to buy this product for your kid – you can get it right away. It is a budget toy to get for your kid. If you are planning to get a good quality and good performance pole for your child – this is the perfect product to invest in. At a very affordable price, it is offering great quality built and modest dimensions. The height of the pole is adjustable manually as well. It is one of the best children friendly basketball portable setups available these days on the market. There is a wide size backboard attached for added support. The dimensions of the basketball pole are very modest and measure to be around thirty inches by forty eight inches. There is a stable base plain attached to the set up that comes with attached wheels for easier moving of the pole setup from one place to another. It is a lightweight setup. The quality of this product is seamless and top notch. It comes with a long-term product warranty. The base comes with detachable wheels for easier motion. The materials used for the built of this basketball pole are superior. This is a worthy product for the kids. It is designed to be high quality and well-built. The height is also adjustable and hence accommodates to children of different age groups. Getting a portable basketball hope for indoor or outdoor use is definitely not a bad idea. There are only a few specifications that you will need to keep in your mind before you make a final choice. Whilst we have left all other details for you to decide on your own; the only thing we can tell you is that we have lined up the best product options that are up available on the market in the present times. So make sure you benefit from a good choice. Done Choosing Your Hoop? Now Start Buying a Best Quality Outdoor Basketball and Start playing basketball game today. With regards to picking a basketball hoop, families ought to first settle on the establishment of a changeless band on their property or the buy of a portable hoop.A convenient circle framework offers all the same ‘all in one’ segments of a perpetual framework with the additional advantage of permitting people to play the game without being restricted to a specific court or stop with an altered ball hoop. The portable basketball introduces in the 1990s.A basketball band is such a positive expansion to a home. The advantages to having a basketball framework in your house are endless. Basketball is an astonishing educating and exercises it. Kids get a brilliant cardiovascular workout, get an awesome plyometric workout and learn to be aggressive. Notwithstanding the capacity to move around, portable basketball hoop has a large number of advantages over in-ground loops. The portable basketball framework accompanies a steel polycarbonate board, which is much more grounded than Acrylic, which is shatterproof. The backboard is Ultra-Violet (UV) ensured and, in this manner, has a high imperviousness to sun harm. 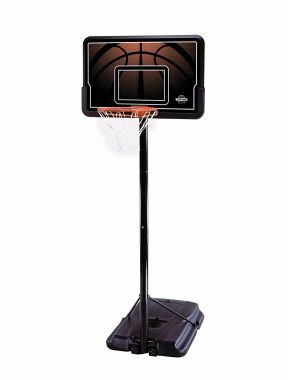 Portable basketball hoop arrives in an assortment of characteristics with the most widely recognized being unified with a bladder balance. Individuals buy convenient ball loops for various reasons. A portable basketball hoop is anything but difficult to set up and can go from ‘box to amusement’ inside a couple short hours. Likewise, numerous individuals need the choice of having the capacity to move the band in the occasion they require the garage space or on the off chance that they move. Portable hoop property holders the adaptability of giving their kids the capacity to play hoops on the off chance that they pick while not paying a high cost or committing to an establishment that could be there for the life of home proprietorship. On the same note, ought to a property holder choose to part with their ball hoop, discarding a compact loop is much less demanding. Portable hoops are a fantastic choice yet in the event that you or your youngsters are serious players a compact circle does not play so well as an in the ground framework. There are numerous imperative parts of a portable basketball framework. To settle on an educated choice about purchasing the best convenient ball hoop for your family’s needs, you would need to invest hours looking into the different parts. The way to settling on the best decision in selecting a portable ball hoop for your family is being educated about what every framework brings to the table and additionally its confinements. It is made basically for you to choose which suits you best. The top of the line portable basketball hoop accessible in the business sector and examined their styles and one of the kind features. Best In Ground Basketball Hoops.